Investors should ignore the noise and look at the bigger picture. Wall Street has conveniently overlooked Cypress Semiconductor's (NASDAQ:CY) solid progress this year. Shares of the chipmaker are down despite a number of positives, thanks to concerns around the company's memory business and a broader slowdown in the chip industry. Investors cannot be blamed for looking two steps ahead and staying away from a company whose financial performance could degrade because of the headwinds outlined above. Analysts expect Cypress' revenue to decrease nearly 5% in 2019. Its earnings are estimated to drop to $1.20 per share as compared with the $1.33-per-share projection for 2018. But Cypress is capable of springing a surprise. 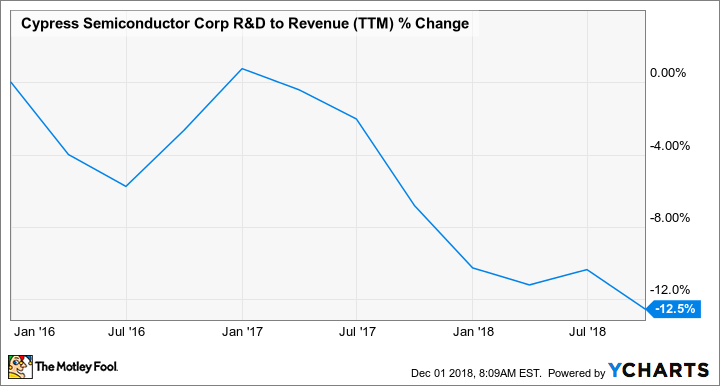 It can sustain its top- and bottom-line growth momentum into the new year and beyond by beating any potential decline in the semiconductor industry. Here's how. Cypress management follows a strategy of pursuing those markets that are growing at a faster pace than the overall semiconductor industry. This strategy, known as Cypress 3.0, has paid off nicely for the company so far. It has managed to turn around its bottom-line performance on the back of steady revenue growth and solid margin gains. Looking ahead, the Cypress 3.0 strategy should ensure further margin appreciation and steady growth because the company is targeting niche areas such as automotive, consumer Internet of Things (IoT), and industrial automation, among others. The automotive market, for instance, is currently supplying 31% of Cypress' total top line. Revenue from this segment jumped nearly 13% annually last quarter, outpacing the 11.3% increase in overall revenue. There are two simple reasons why Cypress will be able to sustain this impressive growth in the automotive business. First, the semiconductor content in cars is expected to increase in the range of 8% to 12% annually through 2021. That might not sound like much at first, but investors need to note that Cypress is specifically going after markets such as advanced driver assistance systems (ADAS) and automotive connectivity, which are predicted to grow at much faster annual rates of 20% and 18%, respectively. Second, the company's solutions are gaining traction among automotive component suppliers. It has landed a host of customers in this space -- such as Denso, Continental, Pioneer, and others -- that have selected a range of Cypress products to power different connected car applications. The chipmaker added yet another automotive supplier to its client list in the latest quarter that the company says has decided to use its instrument cluster solution at a "leading American car manufacturer." In all, it is unlikely that Cypress' automotive business will lose momentum. The same can be said about the company's industrial business, which is another major cog in the wheel with 20% of the total revenue. Cypress estimates that its industrial addressable market will increase at nearly 12% a year through 2021, but thanks to Cypress 3.0, it is growing at a much faster rate in this department. The company's industrial revenue grew 23% annually last quarter thanks to a solid customer base that includes the likes of Cisco, Siemens, Samsung, and LG. Looking ahead, Cypress' industrial segment should remain in solid shape because its products address key challenges in factory automation. Its Excelon F-RAM (ferroelectric RAM) memory product, for instance, is capable of providing long years of service in harsh operating temperatures while eliminating the need for backup batteries. So, Cypress is looking to solve key problems in industries that are predicted to grow in the double digits in the coming years, and that should enable the company to beat the broader market slowdown. We have already seen that Cypress' strategy of getting into fast-growing semiconductor markets has positively impacted its margin profile. That's because the company has been able to launch several "industry-first" chipset solutions targeting different verticals of late, which has possibly allowed it to price its products at a premium. Additionally, Cypress has been really good when it comes to managing its operating expenses. The company has made it clear that it will invest only in those areas where it can drive greater returns. That's why it has managed to keep a handle on a key line item such as research and development expenses without hampering the growth of the overall business. CY R&D to Revenue (TTM) data by YCharts. Cypress is now looking to drive greater margin efficiency within its business by exiting commoditized markets so that it can focus on its core growth areas. It recently entered into a joint venture with memory giant SK Hynix. Cypress will transfer its entire portfolio of single-level cell (SLC) NAND flash memory to the JV for a 40% stake. This will allow the company to go after the automotive, industrial, and IoT markets with greater focus and move on from the cyclical NAND business where it was starting to witness margin pressure. 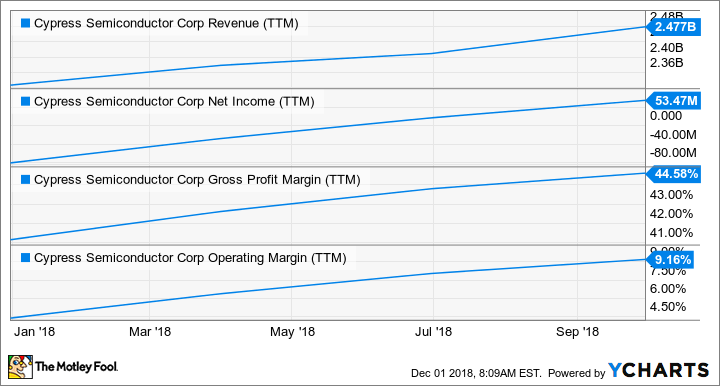 Of course, the move will dent Cypress' earnings profile in the short run, but management is confident that "it will be accretive to Cypress' revenue growth, gross margin and cash flow in the long run." Cypress' remaining memory portfolio will now address the automotive, industrial, and enterprise applications that fit the company's long-term gross margin target of 50%. Cypress investors have focused more on the end-market uncertainty instead of the company's solid execution. The chipmaker has been pulling the right strings to ensure long-term growth in its top and bottom lines, and there is clear evidence that its strategy is working. As such, investors shouldn't lose faith in Cypress and should consider using its pullback as an opportunity to buy more shares. The stock trades at just 11.5 times next year's earnings and has an attractive PEG ratio of 0.77 that indicates undervaluation when its potential growth is taken into account. So, the benefits of getting into Cypress Semiconductor for the long run at this valuation outweigh any short-term headwinds.